The eminent historian Niall Ferguson has devastatingly skewered his (and my) field of study in a talk for the American Council of Trustees and Alumni, subsequently published as "The Decline and Fall of History." He starts with the empirical fact that undergraduates are running away from studying history: compared with 1971 (coincidentally, the year I got my A.B. 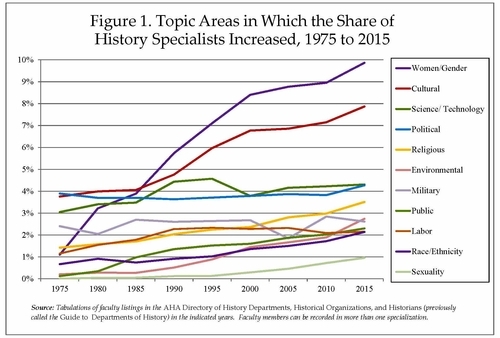 degree), "the share of history and social sciences degrees has halved, from 18% in 1971 to 9%. And the decline seems likely to continue." 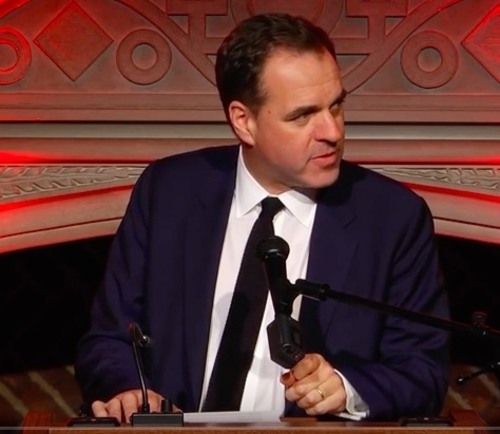 Niall Ferguson delivering ACTA's Merrill Award at the Folger Shakespeare Library on Oct. 28, 2016. The losers in this structural shift are diplomatic and international history (which also has the oldest professors), legal and constitutional history, and intellectual history. Social and economic history have also declined. [Almost] all of these have fallen to less than half of their 1970 shares of the profession. What is the place of emotion in history? The question itself holds multiple meanings, and in this course we consider two in particular: how to write the history of emotion(s), and how the historian's emotions affect the writing of history. Do historians benefit more from proximity to, or distance from, their historical subjects? Should historians of emotion suppress, or cultivate, their feelings of empathy? Does emotive writing inevitably fail the test of scholarly rigour and balance? We will explore some possible analytic frames for the history of emotion and debates over the subjectivity of history, and consider their application to case studies drawn from Australian history. Ferguson reports the "not wholly surprising" fact that "Emotions in History" boasts a total enrollment of one student. Yale competes with its own offerings such as "Witchcraft and Society in Colonial America" and "History of the Supernatural." Ferguson delicately asserts that he does "not wish to dismiss any of these subjects as being of no interest or value. They just seem to address less important questions than how the United States became an independent republic with a constitution based on the idea of limited government." Not only does this new type of history take on minor concerns but it deals with them in miniature ways that amount to what a student dubs "heirloom antiquarianism" and Ferguson calls Microcosmographia Academica – focusing on topics like "the habits of New York restaurant-goers in the 1870s or the makeup of various Caribbean ethnic groups in areas of Brooklyn that made up the West Indian Day Parade in the 1960s" (real examples). Finally, there's the politicizing, moralizing, and anachronistic insistence on judging "the past by the moral standards of the present—and indeed to efface its traces, in a kind of modern-day iconoclasm, when these are deemed offensive." In all, as historians "neglect the defining events of modern world history in favor of topics that are either arcane or agitprop, sometimes both," students flee and the "United States of Amnesia" looms. 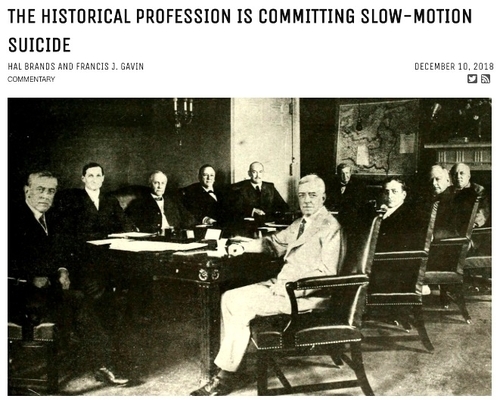 Dec. 10, 2018 update: "The Historical Profession Is Committing Slow-Motion Suicide" write Hal Brands and Francis J. Gavin. Their analysis overlaps with Ferguson's except that they focus more on history's decreasing relevance to statecraft. They start by noting that about 1/5th the number of students now study history in college compared to the late 1960s. Why is this? The discipline mostly has itself to blame for its current woes. 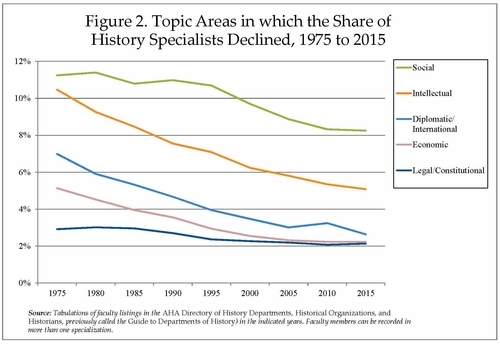 In recent decades, the academic historical profession has become steadily less accessible to students and the general public — and steadily less relevant to addressing critical matters of politics, diplomacy, and war and peace. It is not surprising that students are fleeing history, for the historical discipline has long been fleeing its twin responsibilities to interact with the outside world and engage some of the most fundamental issues confronting the United States. Consider the first of these issues: the retreat of scholarly history from the public square. There was a time when academic historians actively engaged in shaping policy on the critical issues of the day, and when the top academic historians wrote for a larger public audience. Woodrow Wilson engaged the country's leading diplomatic historians to help him prepare for the Versailles Peace conference. Eminent scholars such as William Langer, Arthur Schlesinger, Ernest May, and Richard Pipes served in or consulted with government while retaining their academic positions during the Cold War. Schlesinger, Daniel Boorstin, C. Vann Woodward, and Richard Hofstadter wrote widely read books that drove public debate on issues such as political reform, populism, McCarthyism, and the broader American political tradition. Yet as the historical discipline (like much of the American academy) became more professionalized, especially after World War II, it also became more specialized and inward-looking. Historical scholarship focused on increasingly arcane subjects; a fascination with innovative methodologies overtook an emphasis on clear, intelligible prose. 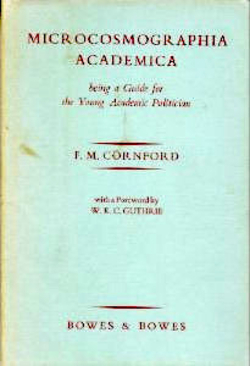 Academic historians began writing largely for themselves. academic historians simply are not focusing their efforts on some of the issues that matter most to the fate of the United States and the international system today. Instead of possessing deep historical knowledge that serves as the intellectual foundation for effective policy and informed debate, the nation risks worsening historical ignorance with all its attendant dangers. ... if the United States does not reinvest in the traditions that academic history departments have left behind, declining undergrad enrollments will be the least of the country's problems.